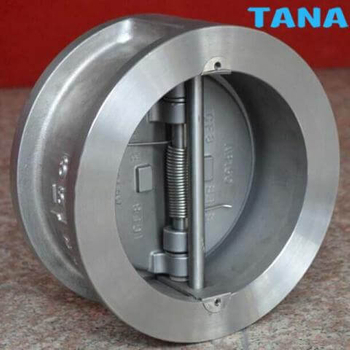 The dual plate check valves has two spring loaded half-moon shaped discs that rotate about their shaft. 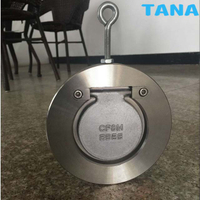 The disc plates are kept shut by the torsion spring. When fluid flows in the forwards direction, the pressure of the fluid causes the disc plates to hinge open, allowing flow. 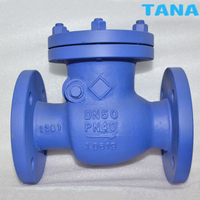 Dual plate check valve is closed by the spring as soon as flow ceases, before any reverse flow can occur. 1.Small in size,light in weight,compact in structure,easy in maintenance. 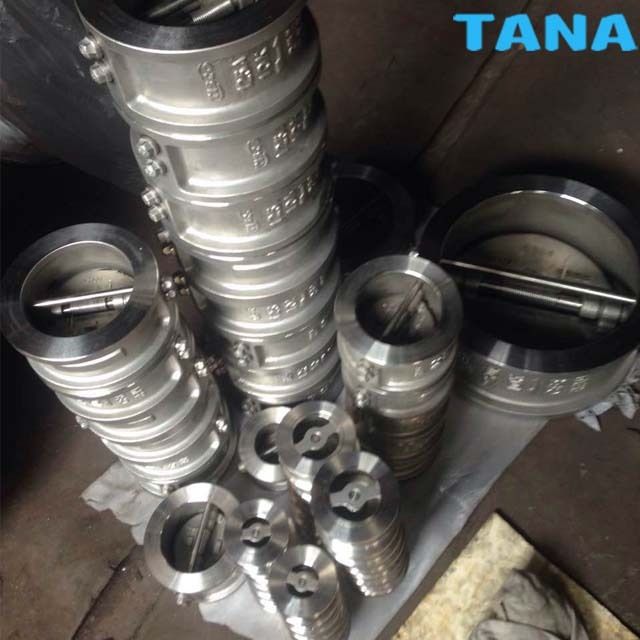 2.Two torsion springs are used excerting on each of the pair valve plates.Which close the plates quickly and automatically. 3.The quick-close action prevents the medium from flowing back and eliminates water-hammer effect. 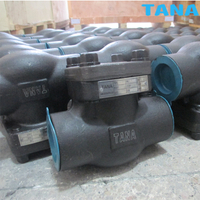 4.This valve is short in length,so that it is rigid and easy to mount. 5.It is easy to install on pipeline which is laid horizontally or vertically. 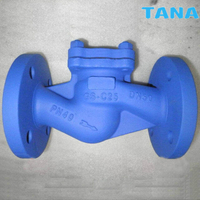 6.This valve is tightly sealed without leakage under the pressure water test. 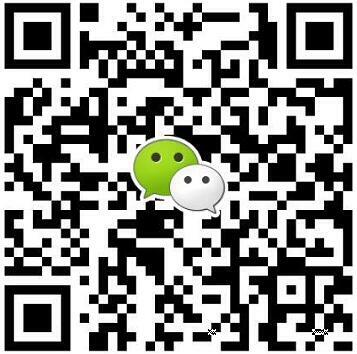 7.Safe and reliable in operation,high interference-resistance. 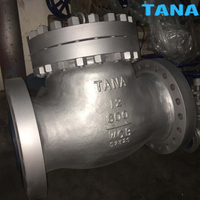 9.The face to face dimensions are in accordance with GB12221-89.ISO5752-82.The stem of the valve should be perpendicular to the horizontal level when the valve is mounted on horizontal pipeling.For vertical installation the direction of flow should be downward. Installation: horizontal / vertical with down-up flow direction. In horizontal position, the axis must be placed in vertical position. In vertical position, the plates must be opened in the same flow direction. 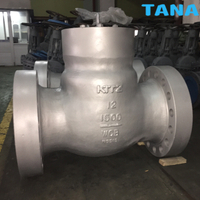 Downstream, a piping of minimum length 5 times diameter, to be installed before the valve, and a pipe of minimum length 2 times diameter after the valve, to allow stabilization of flow and recovery. 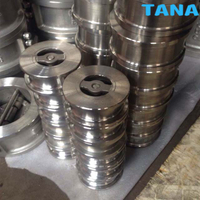 Installation between counter flanges. 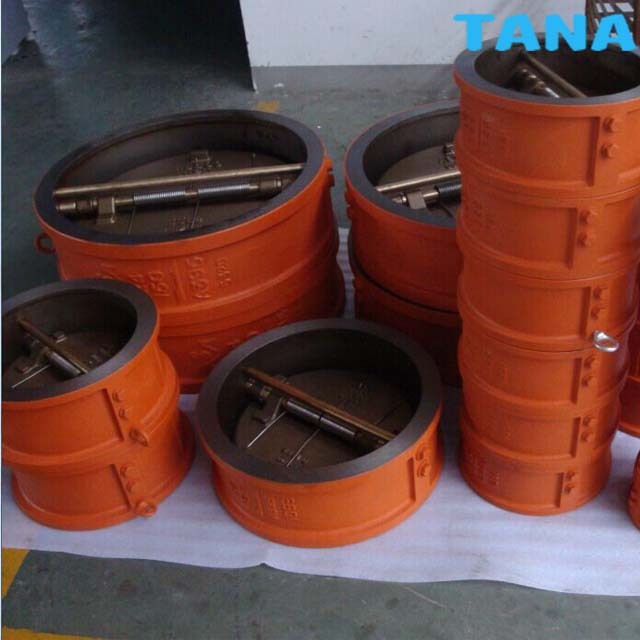 Application:Water supply ,Heating,conditioning systems,Pumping stations , Waste water treatment plants,Irrigation. Suitable medium W.O.G.etc HNO3，CH2OOH etc. 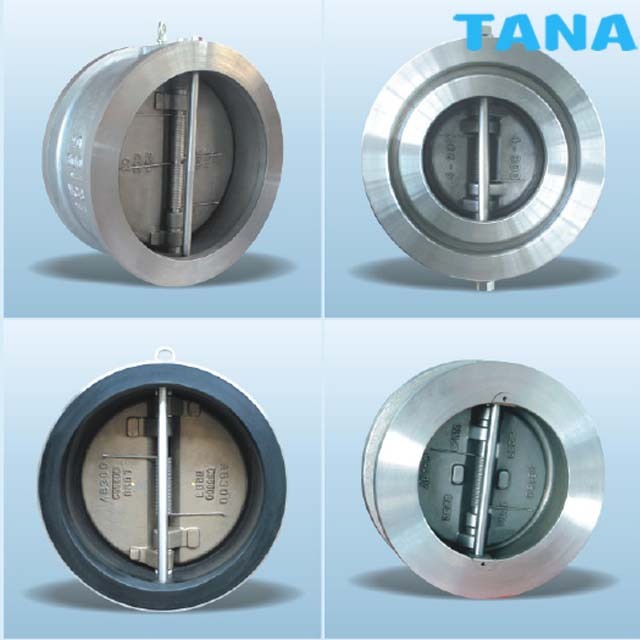 TANA dual plate check valves conform to all industry standards. 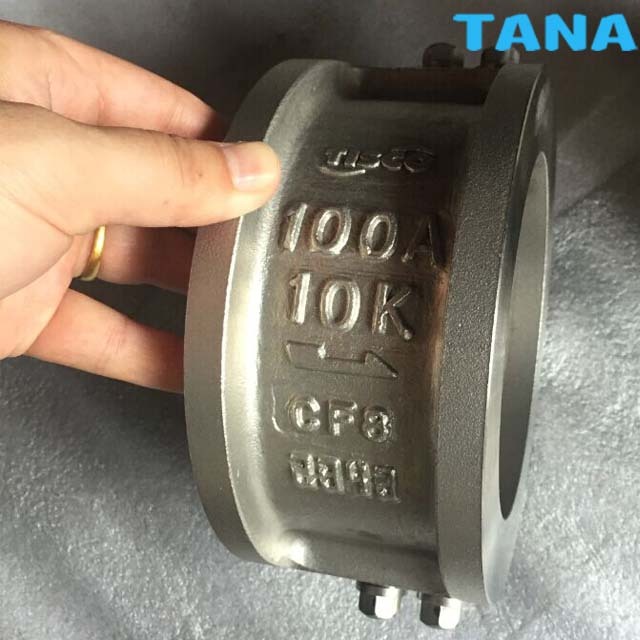 API 594 dictates valve dimensions, including wall thickness, face-to-face dimensions and OD, so valves can replace any make of ANSI Dual Plate Water Check Valve. 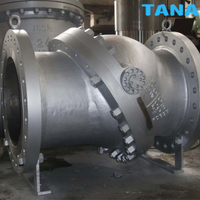 TANA Dual Plate Wafer Check Valves are available in sizes up to 60" in Carbon Steel, 316 Stainless Steel and Ductile Iron and in Classes 125, 150, 300 and 600 psi. Available elastomers include Buna N, EPDM, Viton, Metal and 316SS API Trim 10. Valve internal components can be selected to fit your exact application requirements. 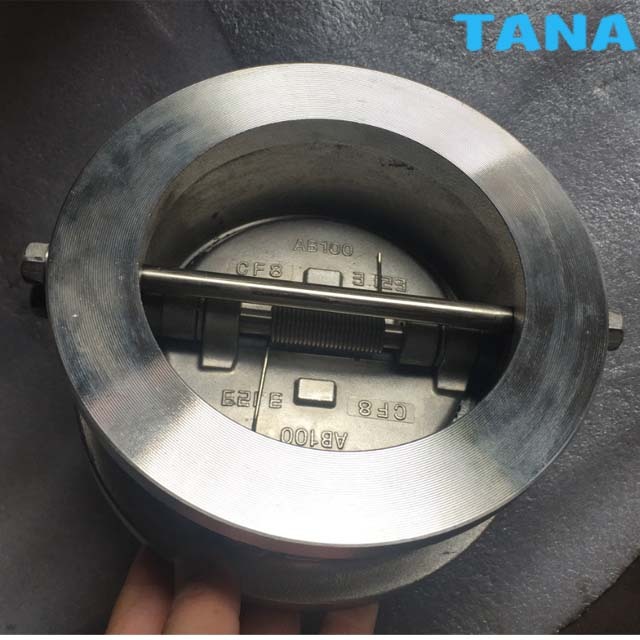 Wenzhou Topnotch Machine Co.,Ltd is a professional leader China wafer Dual plate check valve,double disc wafer check valve,3 inch dual plate check valve,dual disc check valve,wafe type check valve,Butterfly swing check valve manufacturer with high quality and low price.Welcome to contact us!